Richmond, Virginia is a city famous for its scenic James River, countless monuments, and a deeply embedded emphasis on historical and cultural memory. The 1970’s were a turbulent decade in Richmond’s history, as the city grappled to reconcile its old, white-dominated identity of a glorious, Confederate capital, with the new reality of civil rights and integration. Hurricane Agnes struck what is nicknamed the “River City” in the midst of all this, causing the beloved James River to flood to a level unmatched since the eighteenth century. Despite millions of dollars’ worth of damage and multiple deaths, the destruction caused by the James River flood of 1972 was not distinctly preserved in the historical memory of Richmond. In a city that is today filled with monuments, a large new floodwall, and countless memorials, there is no public space commemorating the flood or its victims. Newspaper reports on the flood specific to Richmond are scarce, and historical accounts of the city largely ignore the disaster. Because of this, it seems as if the flood of 1972 is insignificant, but quite the contrary is true. The 1972 James River flood’s insignificance in the historical memory of Richmond is important. Due to the city’s turbulent political environment during the 1970’s, elite Richmonders omitted the James River Flood of 1972 from the city’s historical memory in order to preserve a notion of their city as glorious, economically successful, and historic. From establishment onward, Richmond’s identity has been intimately tied to the James River. Even the city’s name comes from the river: early English settlers christened the city “Richmond” because the view of the James River from the city was strikingly similar to the view of the Thames River from Richmond Hill in England. When William Mayo, Richmond’s first civil engineer, created the first official city plan in 1737, he designed a system of square lots which were concentrated around the James River. Since the founding, the river has remained important in the hearts of Richmonders- locals refer to their hometown as the “river city,” and promotional photos of Richmond almost always include the James. During the 1960’s, a campaign to create a park system around the beloved waterway was created by a few wealthy families who called themselves “river rats.” In 1972, the city acquired the land bought by these families and created a public park system. Today, the extensive James River Park System includes over 550 acres of islands and riverfront shoreline in the heart of the city, and over 500,000 visitors come to the parks per year. Since it is a central feature of Richmond's cultural identity, it seems as though floods and destruction to the James would be well-preserved in the city's memory, making the Flood of 1972 and interesting omission. Beyond its cultural importance, the James River also plays a central role in the geography of the city. Just as William Mayo’s original plan for the city included lots concentrated around the river, throughout the twentieth century (and indeed, still today) many businesses and restaurants were built near the James. In 1972, when Agnes hit Richmond, 349 firms were located in the river’s floodplain. While the north end of the floodplain featured many retail shops and industrial plants, the southern portion contained larger plants like trucking terminals and oil distribution centers. The average width of the river in the city limits is 1,500 feet, and just below the business district the waterway reaches sea level. At the city locks, the river’s flood stage is roughly nine feet, but erosion, a shallow stream, and lack of vegetation because of construction makes the river susceptible to flooding around the business district. Due to the centralization of industry around the river in Richmond, and the propensity of the James to flood, a 1972 article in The Journal of Risk and Insurance concluded that “floods are now a major peril of concern to businessmen in Richmond’s floodplain.” Nonetheless, Richmond businesses continued to be built along the James River’s banks. When studying the historical memory of the 1972 James River flood, it is important to understand the overwhelming presence of monuments, memorials, and museums in Richmond. Memories of the city’s past are emphasized throughout the area, making historical memory an important part of Richmond. Over 150 monuments are scattered within the city’s limits, contributing to the city’s identity just as the James River does. Although the river is enjoyed by all classes of citizens, the monuments and museums in Richmond largely identify with white, upper-class members of society. These Richmonders take pride in Richmond’s most famous attraction: Monument Avenue, the only street in the United States to be considered a National Historic Landmark. This road, lined with enormous statues, is a tribute to Civil war figures interrupted by the more recent addition of a statue of Arthur Ashe, an African American tennis star from Richmond. As described by Robert C. Layton in his book, Discovering Richmond Monuments: A History of the River City Landmarks Beyond the Avenue, the city’s monuments define the city, and historically helped “[move] Richmond in stages from a tiny burg to an important contributor to manufacturing, the arts, and finance.” In a city so focused on preserving historical memory through public commemorative spaces, it is important to ask why there is no memorial or monument to the victims of Hurricane Agnes in Richmond. Most monuments in Richmond focus on glorifying single individuals, instead of events like Agnes that harmed the city. While statues of individuals such as Thomas Jefferson, Confederate heroes, and wealthy Richmond philanthropists like Joesph Bryan and Jame Henry Dooley (all present in Richmond and referenced in Layton's Discovering Richmond Monuments) portray an image of Richmond as a prosperous, dignified city, monuments to tragedy and death demonstrate weakness. Because of this, a public commemoration for the wreckage caused by Hurricane Agnes has been intentionally neglected by the wealthy Richmond natives who have historically controlled the city's addition of monuments. Hurricane Agnes struck Richmond at a difficult time- the 1970’s were a contentious period in Richmond politics, filled with race and class conflicts. A year before Agnes hit, all city council elections in Richmond were halted by the Supreme Court due to racially motivated attempts at annexation. In City of Richmond v. United States, the Court ruled that the city council’s plans to annex parts of Chesterfield County were caused by the desire to acquire white neighborhoods, as many Caucasian Richmonders participated in “white flight” after the integration of public schools. Debates over desegregation busing to try and compensate for previous racial segregation in schools were also heatedly taking place in the city. A year before the flood, Federal District Judge Robert Mehridge, Jr. ordered mandatory citywide busing for schools in Bradley v. Richmond School Board. This only furthered white flight to the suburbs, so in 1972, Mehridge extended busing to Richmond's surrounding counties, saying it was “the only remedy promising success.” Just days before Hurricane Agnes hit Richmond, the U.S. Fourth Circuit Court of Appeals struck down Mehridge’s decisions on mandatory busing. Due largely in part to this controversy over race issues, the state elections in 1973, just one year after the flood, had a record high voter turnout. The heated political environment caused by racial tensions and desegregation challenged the historically white, prosperous view of the city held by Richmond’s upper class. Hurricane Agnes was the perfect storm: easy to underestimate, but quick to destroy. It began over the Yucatan Peninsula of Mexico on June 15, 1972, and slowly headed northeast, losing strength after making landfall in Florida. However, Agnes quickly regained strength over the Atlantic when it moved east off the coast of North Carolina on June 21st. It then headed northwest over New York and Pennsylvania, causing 117 deaths and $3.1 billion in estimated damages before subsiding in Canada by June 25th. Agnes was widely underestimated by meteorologists in the hours leading up to the storm because of her unique path. Most predicted that Agnes would continue into the Atlantic once she left land and headed over the ocean, as almost all hurricanes do. Instead, the erratic storm veered west, leaving the sea and wreaking more havoc on the East Coast. Richmond, Virginia was deeply affected by Agnes’ fury. Heavy rain flooded the James River, which has a shallow stream and is thus susceptible to extreme widening from only a few feet of rainfall. At the city’s locks, the James crested at a height of 36.51 feet- over 6 feet more than the previous record. The river flows through the center of the city, and many retail stores, industrial plants, and businesses are located in its floodplain. The 1972 floods incurred over $33 million in damages to those Richmond firms, and four Richmonders drowned when their car plummeted into the swollen James River. The floods reached the city’s water filtration plant, resulting in long lines for fresh water at Richmond’s Willow Lawn shopping center, where portable filtration units were brought. Across the state of Virginia, Agnes’ floods caused over $145 million in damages (some estimates cite nearly $300 million) and killed 13 people, most due to drowning. The Journal of Risk and Insurance, which conducted a survey of damages from the flood soon after Agnes hit, concluded that the 1972 flood was the highest recorded flood in Richmond since 1771. I write this standing in line for water with Momma, as I have been doing for the past hour. When this darn hurricane started brewing about six days ago somewhere down in Mexico none of us thought it would matter. “Agnes” (as the weathermen on TV call the storm) wasn’t even a hurricane anymore by the time she hit us! Imagine that- a wimpy ole storm that’s not even a hurricane making me stand in line for fresh water. Well, here I am, at Willow Lawn shopping center, where the city brought tanks of fresh water, acting as if they’re doing us some big favor. I say it’s their fault the water plant is located in the river’s floodplain in the first place! I mean seriously, who thought that was a good idea! Well, at least I have something to channel my anger towards. When Agnes hit, she brought more water than you have ever seen. The entire area downtown is flooded. Things have been rough at home because Daddy can’t go to work at the train station, and we don’t know when he will be able to return. I don’t see knee-deep levels of water disappearing any time soon. Meanwhile, the city keeps on trying to cheer us up, saying that everything will be okay and that Richmond will overcome. The only thing that is overcoming is the RIVER, overcoming the city. Luckily, our house is far enough away from the James that we didn’t face any damage (unlike those stupid businessmen who insist on building their companies right up on the water). Plus, I don’t care what Daddy says- I like having him home for once. I have to go now, diary. It’s too hot and humid to write- the sweat is dripping off my face onto these pages. Not that it is any better at home where there is no power. Hopefully we will get some water soon. I’ll keep ya posted. What caused Richmond to omit this huge, destructive flood from its historical memory? The boiled-down answer to that question is this: the turbulent political environment of the 1970's threatened the city’s deeply rooted identity, and there was no room for another threat. Instead of coming to terms with the damage caused by Hurricane Agnes, elite Richmonders (such as Virginius Dabney, who is explained in the next section) brushed aside the flood, pretending it did not happen. This is why no monument to the flood exists, and why newspaper articles at the time did not go into detail about the flood, briefly listing deaths but providing no real information about the wreckage. The primary threat to upper-class Richmonders’ grand, historic, white-dominated vision of their city, modeled by Monument Avenue and the Museum of the Confederacy, was integration. Although schools officially became integrated in 1954 with the Supreme Court decision in Brown v. Board of Education, “Massive Resistance” in Virginia, led by Senator Harry F. Byrd, Sr., kept public schools from integrating. After public schools in Richmond were finally integrated, whites fled to the suburbs, ensuring that schools remained de facto segregated by race. This, along with debates over busing and the failure to annex counties where whites fled due to the Supreme Court’s decision in City of Richmond v. United States, dominated the political scene in Richmond when Hurricane Agnes struck. No longer could the city be considered a preserved version of the capital of the Confederacy. The whites striving to keep Richmond a prosperous, grand Southern city were already reconciling with integration. There simply was no room for a devastating flood. before, many white residents fled the city limits prior to 1972 due to school integration. Between 1960 and 1975, the percentage of white students in Richmond city schools dropped from 45 percent to 21 percent, indicating a significant departure of whites out of the city. Furthermore, neighborhoods near the river within the city limits, which would have been hit hardest by the 1972 flood, were composed mostly black residents. For example, census tract 413, located on the James River, was 99% African American, according to the 1970 U.S. census. Because most wealthy whites did not experience the flood intruding into their homes, they could comfortably erase the flood from accounts of the city, failing to publish accounts of its wreckage in their newspapers and neglecting to create a space for public commemoration. Neglecting the flood of 1972 was not the only action taken by white residents to combat threats to their vision of the city. In 1973, Belle Isle, a 54-acre island in the James River, located near downtown Richmond, was obtained by the city and formally made into a park. This island was used as a prisoner of war camp during the Civil War, where over 30,000 Union soldiers were imprisoned and placed into wretched conditions by the Confederate military. By transforming this space, infamous to the Union soldiers during the war, into a now beloved park, Richmonders were celebrating and preserving their gruesome Confederate past. The two most informative primary sources that demonstrate how the flood of 1972 was omitted from the historical memory of the city in order to preserve a preconceived notion of perfection are Virginius Dabney’s Richmond: The Story of a City and “Agnes,” a poem by Alan Rosenberg from “Flood of ’ 72.” Virginius Dabney’s book, which describes the history of the city, provides a glimpse of how upper-class, white Richmonders wished for their city to be remembered in history. The poem by Alan Rosenberg, a man from Pennsylvania, demonstrates how the flood was preserved in the memory of cities not concerned with protected a preconceived notion of prosperity, providing contrast for the way Dabney and other Richmonders framed the flood during the 1970's. Portions of Richmond: The Story of a City can be found online at Google Books here. This analysis focuses on the final two chapters, "The Postwar Years" and "Richmond in the Mid-Seventies." In the first edition of this book, which was the edition written during the 1970's and used in this primary source analysis, these chapters begin on page 334 and span until the end of the book. Virginius Dabney was a truly a representative of a Virginian elite: as if his first name does not tell enough, he was born in Charlottesville in 1901 as the grandson of a Confederate soldier and a descendant of Thomas Jefferson. Dabney lived most of his adult life in Richmond, working as the chief editorial writer for two of the city’s most popular newspapers. In 1976, with a Pulitzer Prize already under his belt, Dabney published Richmond: The Story of a City. The 412-page history of Richmond spans from the city’s founding to the mid-seventies and seems like a history textbook, but it is in fact a veritable primary source of historical memory in Richmond. With Richmond: The Story of a City, Dabney actively constructs a narrative of Richmond’s history from the vantage point of the 1970’s, deliberately choosing events to portray in his penned memory of Richmond. When the final two chapters of The Story of a City, entitled “The Postwar Years” and “Richmond in the Mid-Seventies” are read as a primary source, they provide a glimpse of how the events of the 1970’s were preserved by Virginius Dabney in history. Ultimately, The Story of a City, specifically the last chapters, demonstrate intentional forgetting. Dabney glosses over formative and contentious issues of the 1970’s, namely race issues and the 1972 James River Flood, in order to preserve his fixed idea of Richmond as a glorious Confederate capital in his historical narrative. The idyllic image of old Confederate Richmond Dabney tried to perpetuate in Richmond: The Story of a City. 1970’s Richmond, or the “holy city,” as some members of the Virginia General Assembly called it, was to Dabney a pristine, historic relic with vast economic success. He applauds the city’s status as the Confederacy’s capital, condemning the removal of the rebel flag from a cemetery as “nothing short of tragic,” and refers to Monument Avenue, a boulevard filled with monuments to Confederate soldiers, as “one of the truly splendid avenues in the United States.” Dabney portrays Richmond as an economic hub, on par with other major cities in the South and second only to Atlanta. In the final two chapters of Story of a City, Dabney either neglects to mention or underplays the importance of two important events that do not fit into this framework of Richmond as the perfect city: race and the floods caused by Hurricane Agnes. The original text of the poem, "Agnes" by Alan Rosenberg, and the booklet it was published in. A flood was on its way. Just why they named her "Agnes"
This poem, written by a Pennsylvanian who experienced Hurricane Agnes, serves as a stark contrast to Virginius Dabney’s account of the storm in his book. Unlike Dabney, Alan Rosenberg vividly describes the horrors of the storm, personifying the hurricane and providing a visual description of the aftermath of the flood. While Dabney brushes over the actual flood and instead insists that Richmond will recover quickly, Rosenberg explains that a “lifetime of possessions” were lost in the flood, and that anything left over was covered “thick with grime.” Furthermore, the poet expresses the unexpected nature of the flood, describing how the river was “tranquil” and residents were not “wary” that a storm was coming. Rosenberg accurately preserves the flood in his poem by focusing on communicating to readers the realities of the flood: Agnes’ floods were not a small hurricane to be forgotten. They were truly an underestimated nightmare. The source of this poem is important to consider: although found in a post-flood report published by the U.S. Army Corps of Engineers (as shown in the photo to the right), the poem originally appeared in “Flood of ’72,” a memorial volume compiled by Harrisburg Public Library in Pennsylvania. Hurricane Agnes affected Pennsylvania as well as Virginia, causing major flooding to the Susquehanna River which resulted in an estimated 48 deaths, along with millions of dollars’ worth of damage. Unlike Virginians, Pennsylvanians from Harrisburg, who were not facing the same political tension and drastic shift in their locale’s identities due to race issues, carefully preserved this flood in their city’s historical memory. Instead of choosing to erase the flood from the historical memory of the city, as Richmonders did, Harrisburg natives expressed their experiences during the flood in a memorial volume, consisting of 51 pages of poetry about the disaster. Considering the damage done to Virginia’s capital city by the Flood of 1972, a similar memorializing publication should exist. Because of the turbulent political environment at the time, this is unfortunately not the case. An official U.S Government report published after Hurricane Agnes, extensively explaining the flooding caused by the storm, expressed the potential for improvement left in the wake of Agnes. The writers of the report conclude by saying: “Hopefully, this documentation of Hurricane Agnes floods will aid the understanding of such flood disasters and will help improve human preparedness for coping with future floods of a similar catastrophic magnitude.” Unfortunately, as demonstrated by high-society Richmond’s intentional forgetting of the flood and the failure to create new flood protection structures until decades later, the hopes of the government documenters were not borne out in Virginia. Not only did elite Richmonders fail to accurately preserve the disastrous flood of 1972 in their city’s historical memory, but they also failed to learn from Anges’ lessons. Though Hurricane Agnes caused floods higher than any others since 1771, completely ravaging over 200 blocks of the downtown district and demonstrating the need for better flood planning, a floodwall was not constructed in Richmond until 1994. This $143 million dollar project was dedicated on October 21, 1994, and has since become an outdoor attraction of the city, lined with parks and walking trails. Although the 3.2 mile-long floodwall is equipped to protect the city from floods with an average recurrence interval of 280 years, it is not capable of protecting the city from another flood equal to that caused by Hurricane Agnes in 1972. The floodwall’s official website cites Hurricane Agnes as one of eight floods between 1969 and 1987 that led to the wall’s construction, but it fails to justify why the structure would not be able to withstand another flood of 36.5 feet. Richmonder’s failure to preserve the flood in the city’s memory coincided with their failure to learn from the damage caused by the flood of 1972. Furthermore, Richmond businesses are still concentrated right in the middle of the James River floodplain, just as they were in 1972. Shockoe Bottom, a highly flood-prone area adjacent to the river and just east of Downtown Richmond, contains many of the city’s most popular restaurants and shops, and there have recently been proposals to build the city’s baseball stadium there (which would not only place the stadium at risk for floods, but would also build over top of a former slave trading site, furthering the process of hiding negative memories in Richmond). These buildings may be currently protected by the floodwall, but the wall is not equipped for the most extreme flooding possible in Richmond. The question of another flood of Agnes’ magnitude occurring is not if, but when. When another 36.5 foot flood does occur, as it eventually will, the floodwall will be ill-equipped to handle the damage. Due to the buildup of structures along the James River because of Richmond’s unchanging love of the James, even more damage will be done than the $33 million incurred by Agnes. Hurricane Agnes’ legacy had the potential to serve as an important lesson to Richmond about flood control. Instead, it was forgotten from the historical memory in order to preserve a white-centered ideal of the previous capital of the Confederacy. The next time a record-breaking flood occurs, Richmonders will not be able to forget. ↑ Byrd, William. Advertisement for the Founding of Richmond (1737), Virginia Gazette. Photograph. Encyclopedia Virginia: A Publication of Virginia Foundation for the Humanities. July 19, 2012. Accessed December 7, 2014. http://www.encyclopediavirginia.org/media_player?mets_filename=evr5071mets.xml. ↑ Valentine Richmond History Center. Students protesting busing plan. Photograph.Virginia Historical Society: Collections and Resources. 2014. Accessed December 7, 2014. http://www.vahistorical.org/collections-and-resources/virginia-history-explorer/civil-rights-movement-virginia/school-busing. ↑ Ray Sterner and Steve Babin, Hurricane Agnes, illustration, University of Maryland: Department of Atmospheric and Oceanic Science, 2006, accessed December 6, 2014, http://meto.umd.edu/~stevenb/hurr/old/old.html. ↑ The Library of Virginia. Richmond Rooftops. Photograph. Flickr. February 20, 2012. Accessed December 7, 2014. https://www.flickr.com/photos/library_of_virginia/7790613150/in/set-72157631085799258/. ↑ Richmond.com (Richmond, VA). "Agnes Makes Recent Weather Woes Seem Mild." July 8, 2012. Accessed December 8, 2014. http://www.richmond.com/news/article_4841752a-2b0a-5f49-90c2-3e28bae1f63f.html. ↑ Valentine Richmond History Center. Richmond You're Livin Good'. Photograph. Fan of the Fan. February 2013. Accessed December 8, 2014. http://fanofthefan.com/2013/01/talking-about-richmond-in-the-1970s/. ↑ Photo found on: https://www.flickr.com/photos/brad_prudhon/6341950719/. Taken November 13, 2011. ↑ William Byrd, "Advertisement for the Founding of Richmond (1737)," Virginia Gazette (Williamsburg, VA), April 22, 1737, accessed December 7, 2014, http://www.encyclopediavirginia.org/Advertisement_for_the_Founding_of_Richmond_1737. ↑ Friends of the James River Park. "History of the Park System." The James River Park System. Last modified 2014. Accessed December 6, 2014. http://www.jamesriverpark.org/visit-the-park/history.php. ↑ Friends of the James River Park. “About the Park: Wilderness in the City.” The James River Park System. Last modified 2014. Accessed December 6, 2014. http://www.jamesriverpark.org/visit-the-park/about-the-park.php. ↑ S. Travis Pritchett and Harvey W. Rubin, “A Case Study for Flood Losses: Implications for Flood Insurance Product Development,” The Journal of Risk and Insurance, 42, no. 1 (March 1975): 106, accessed September 12, 2014, http://www.jstor.org/stable/pdfplus/251591.pdf?&acceptTC=true&jpdConfirm=true. ↑ Robert C. Layton, Discovering Richmond Monuments: A History of River City Landmarks Beyond the Avenue (Charleston: History Press, 2013), page 16. ↑ National Park Service: U.S. Department of the Interior. "Monument Avenue Historic District." National Park Service. Last modified 2014. Accessed December 7, 2014. http://www.nps.gov/nr/travel/richmond/MonumentAveHD.html. ↑ Virginia Historical Society. "Civil Rights Movement in Virginia: School Busing. "Virginia Historical Society: Collections and Resources. Last modified 2014. Accessed December 7, 2014. http://www.vahistorical.org/collections-and-resources/virginia-history-explorer/civil-rights-movement-virginia/school-busing. ↑ Larry J. Sabato, “Virginia Politics in 1973: The State Elections,” The University of Virginia Institute of Government Newsletter, August 1974, page 2, accessed October 13, 2014, http://www.coopercenter.org. ↑ Science News, “The Hard-Learned Lessons of Agnes.” Science News: Magazine of the Society for Science & the Public 102, no. 1 (July 1972): 5-6, accessed September 12, 2014, http://www.jstor.org/stable/3957523 . ↑ Director, National Hurricane Center. "Report on Hurricane Agnes." U.S. Department of Commerce: National Oceanic and Atmospheric Association, July 24, 1972. Accessed December 6, 2014. http://www.nhc.noaa.gov/archive/storm_wallets/cdmp/dvd0183-jpg/1972/atlantic/agnes/postevent/report_va24.jpg. ↑ Robin Beres, “Agnes Makes Recent Weather Woes Seem Mild,” The Richmond Times Dispatch, July 8, 2012, accessed September 13, 2014, http://www.timesdispatch.com/news/agnes-makes-recent-weather-woes-seem-mild/article. ↑ “Agnes Causes Shiver Across Wide Area,” The Windsor Star, June 22, 1972, accessed September 13, 2014, http://news.google.com/newspapers?id=V0M_AAAAIBAJ&sjid=zlEMAAAAIBAJ&pg=2163,3108673&dq=hurricane+agnes+new+york&hl=en. ↑ Valentine Richmond History Center. "School Busing." The Virginia Historical Society: Collections and Resources. Last modified 2014. Accessed December 7, 2014. http://www.vahistorical.org/collections-and-resources/virginia-history-explorer/civil-rights-movement-virginia/school-busing. ↑ U.S. Bureau of the Census. "Census of Population and Housing: 1970, Final Report PHC(1)-173 Richmond, Va." Census Tracts: Richmond, VA. Last modified 1972. Accessed December 7, 2014. http://www2.census.gov/prod2/decennial/documents/39204513p18ch01.pdf. ↑ Richmond City Government. "Richmond Riverfront Plan: Belle Isle History." Richmond Riverfront Plan. Last modified November 26, 2012. Accessed December 7, 2014. http://www.richmondgov.com/PlanningAndDevelopmentReview/documents/2_Belle_Isle.pdf. ↑ Virginius Dabney, Richmond: The Story of a City (Garden City: Doubleday & Company, 1976), 359. ↑ Virginius Dabney, Richmond: The Story of a City (Garden City: Doubleday & Company, 1976), 372. ↑ Virginius Dabney, Richmond: The Story of a City (Garden City: Doubleday & Company, 1976), 368. ↑ Virginius Dabney, Richmond: The Story of a City (Garden City: Doubleday & Company, 1976), 355. ↑ Poem source (shown in photos also): J. F. Bailey, J. L. Patterson, and J. L. H. Palhus, Hurricane Agnes Rainfall and Floods, June-july 1972, Geological Survey Professional Paper 924 (Washington, D.C.: U.S. Geological Survey and the National Oceanic and Atmospheric Administration, 1975), accessed December 7, 2014, http://pubs.usgs.gov/pp/0924/report.pdf. ↑ NOAA. "U.S. 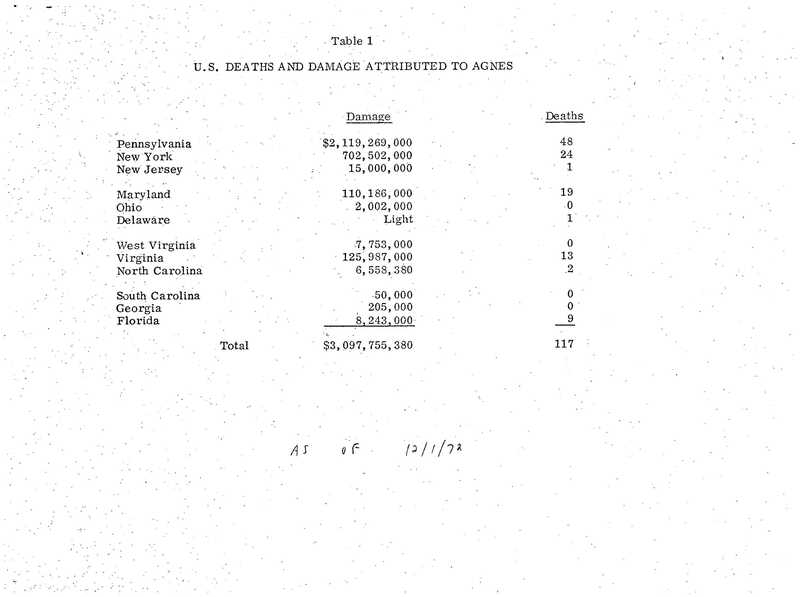 Deaths and Damages Attributed to Hurricane Agnes." Table. National Weather Service: National Hurricane Center. Accessed December 8, 2014. http://www.nhc.noaa.gov/archive/storm_wallets/cdmp/dvd0183-jpg/1972/atlantic/agnes/postevent/damageanddeaths.jpg. ↑ Harrisburg Public Library, comp. Flood of '72: A Memorial Volume. Harrisburg, PA: Harrisburg Publishing Company, 1972. ↑ J. F. Bailey, J. L. Patterson, and J. L. H. Palhus, Hurricane Agnes Rainfall and Floods, June-july 1972, Geological Survey Professional Paper 924 (Washington, D.C.: U.S. Geological Survey and the National Oceanic and Atmospheric Administration, 1975), accessed December 7, 2014, http://pubs.usgs.gov/pp/0924/report.pdf. ↑ The Library of Virginia. Hurricane Agnes: 1972. Flickr. February 20, 2012. Accessed December 7, 2014. https://www.flickr.com/photos/library_of_virginia/7790614394/in/set-72157631085799258/. ↑ Outside Ventures. "Floodwall Park (James River Park System)." Richmond Outside. Accessed October 14, 2014. http://www.richmondoutside.com/destination/floodwall-park-jrps/.